I'm trying to get through these cassettes, but it's becoming something of a slog as a lot of them just aren't very good. 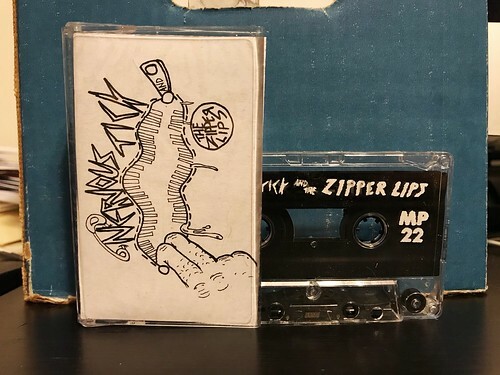 Nervous Tick and the Zipper Lips are one of those bands that fit in that category. Their band name isn't good and the 6 songs on this tape also aren't very good. Now I will say that it's somewhat impressive that every instrument on this album is played by the same guy. Though you could also make the jack of all trades/master of none argument. Everything sounds rough. The recording quality is lo fi and it's really just a demo. I get that, but it ends up sounding like any one of a thousand high school punk rock bands that play three shows at house parties and then go off to college and/or working at K mart. I'm sure it's fun for them, but let's be honest. No one wants to listen to that. The last song "Scib Dobbin'" is probably the best as it at least makes an attempt to be catchy, but it's also pretty silly. I don't really have much else to say about this. I just don't like it. It's mostly a lot of yelling over basic screechy guitar and the occasional keyboard.